While the soup was simmering , I followed instructions to heat the oven to 400 . 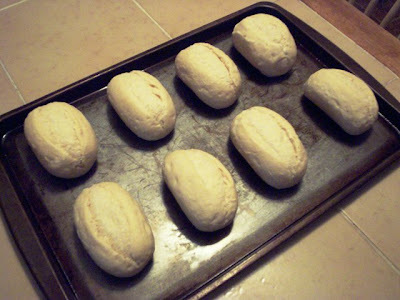 Then I placed the frozen rolls on an un-greased cookie sheet and popped them in to bake for 10 minutes . THAT'S IT !!! EASY - PEASEY !!!!! Verdict .........great ! 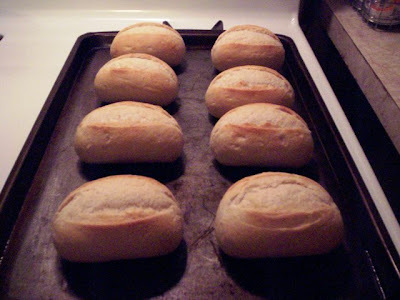 Crusty on the outside ....soft & chewy on the inside ...nice & hot with butter melting inside ......ummmmmmm . And , as I predicted ......they went GREAT with the soup . What a nice warm dinner . 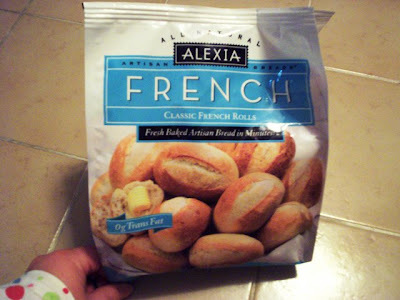 As expected from the ALEXIA company , they are all natural ...0g fat ....cholesterol free and 100 cal. per roll . ( I don't know HOW many calories for all that butter you put in ) LOL . Best of all you can keep them in the freezer and just take out how many you need at a time . So convenient . Oh yeah .....they were $ 3.99 for an 8-roll bag . Not bad . So pick some up next time you shop and serve them with your " fancy " french dinner or some Italian soup , like I did . You won't be sorry .